The topology produced by ZRemesher tries to respect your model’s shape as much as possible. However, no program can have the same understanding of your model and its needs as you the user. For this reason you can help ZRemesher by drawing curves on the model. These curves are used as guides to refine the natural flow of your model. The result is that you can ensure that the new topology will have edges exactly where they are needed. The Tool >> ZRemesher >> Curve Strength slider lets you control how you wish your curves to be used to more or less rigidly guide the flow of the polygons. The lower the Curve Strength slider value, the more flexibility ZRemesher will have when calculating the new topology. In this case, the curves serve as guides. The higher the slider value, the more rigidly ZRemesher will adhere to the guide curves. In this case, the guides become rules. In ZRemesher, the automatic computing of natural polygon flow has a strong influ­ence, even over the curves. This means that if you wish to really change the direction of the flow of polygons in a way that ZRemesher would be unlikely to consider “natural”, you need to define curves to force a less efficient flow of the polygons. The larger the area where you wish to drastically change the flow of polygons, the more curves will be needed. To draw these curves on your model you must use the ZRemesher Guide brush. This brush works similarly to other Curve brushes, but has certain caveats: These curves cannot be edited except to extend them or to connect a new curve to the end point of an existing curve. The curves can, however be deleted by holding the Alt key and drawing another curve perpendicularly over the one you wish to delete. On the left, guides created with the ZRemesher Guide brush and associated with a density varia­tion. 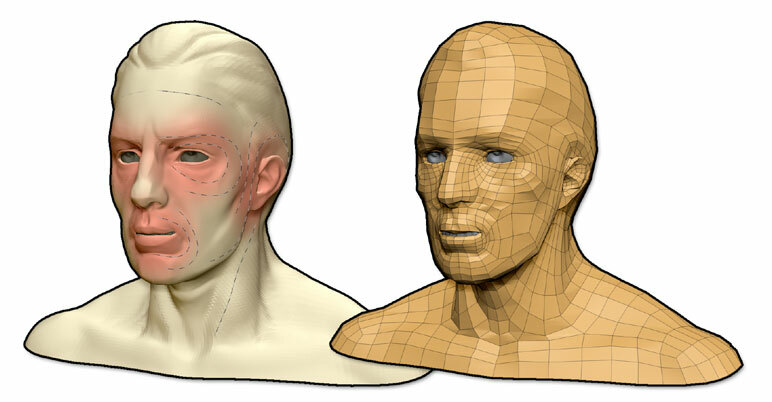 On the right, the resulting low polygon mesh with loops around the mouth and eyes.